After missing 3 months of favorites, I figured it was about time for me to do another post of what I have been loving lately. This month's favorites consists of a lot of lip products, a couple of miscellaneous cosmetics, along with my new favorite accessory and my new favorite book. 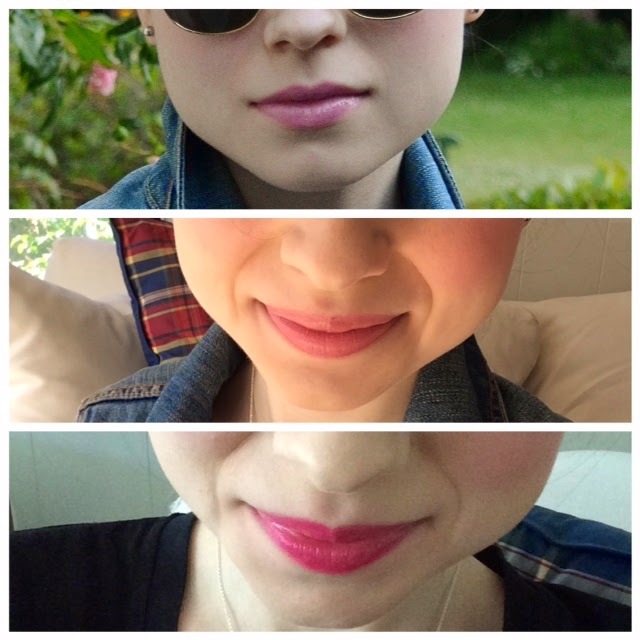 For lip products, I have been obsessed with all things pink and summery. As a MAC lipstick addict, I am always up for adding a new gem to my collection. This past month, I purchased "Snob", a pinky lilac shade that I absolutely adore. I love wearing it under MAC "Morning Glory" Lustreglass and lining my lips with MAC's "Hip 'N Happy" lip pencil. I'ts the perfect pairing. I also bought my first Topshop lipstick in the shade "Pillow Talk", the perfect pink color. It gives me a "your lips but better" look that is great during the daytime. A drugstore score for me this past month was a Revlon Just Bitten Kissable Balm Stain in the shade "Lovesick". I cannot say enough good things about this product. The bright fuchsia color stays put on my lips and feels moisturizing and amazing. I also love its refreshing minty scent. If you're looking for the perfect summer lip color that is lightweight, long lasting, and affordable, check this one out. I had two miscellaneous beauty favorites in June. The first favorite is Maybelline Great Lash clear mascara. I use this to keep my brows in place when I use my Anastasia Brow Wiz pencil. It lasts all day long and keeps the color locked in and my brow game strong! Who doesn't want fierce eyebrows? My final beauty favorite is Benefit "Porefessional". I use this with my Bobbi Brown foundation and Smashbox Camera Ready BB Cream and it works wonders. It keeps my skin looking smooth and my makeup feeling natural. Because of "Porefessional", I rediscovered my Smashbox BB Cream. I didn't like how it looked without a primer, but when I used "Porefessional", it gave my skin a natural, shine-free finish. The "Porefessional" and my BB cream are the beauty dream team. My Ray-Ban "Clubmaster" sunnies have been my go-to accessory. They are one of my favorite purchases ever. I love the gold trim around the lenses and the tortoise detail on the rims. The tortoise print goes with everything and, unlike black sunglasses, doesn't look too harsh against my pale skin. I know I will wear these not only in the summer, but year round. Sunglasses are my new staple. My final June favorite is The Fault in Our Stars by John Green. This book was simply amazing. I loved the story, the characters, and the message. This was the first book I've read by John Green and I cherished every word. His writing style is unlike any other and full of so much meaning and wisdom. The Fault in Our Stars was a joy to read, even though it brought tears to my eyes. I can't wait to see the movie and, based on the reviews I've read, it looks like a winner. I have just brought that book, I can't wait to start reading it! I have read Looking For Alaska by John Green which is one of my favourite books of all time!! Thank you :) You'll love The Fault in Our Stars! Looking for Alaska is on my to-read list.